The Bon Marche department store prepared in April 1950 to open at Northgate Mall, described at the time as a “suburban” location. Once when we were young, life revolved around the shopping mall and the automobile, and that life was sweet. The mall offered a cornucopia of shops on clean, spacious corridors. At each end they were anchored (a word seemingly as forged from mid-20th century American retailing as from ships) by department stores. The family car was a magic carpet on the rapidly expanding road system, especially freeways — the very word embodied the sense of independence these public works promised. 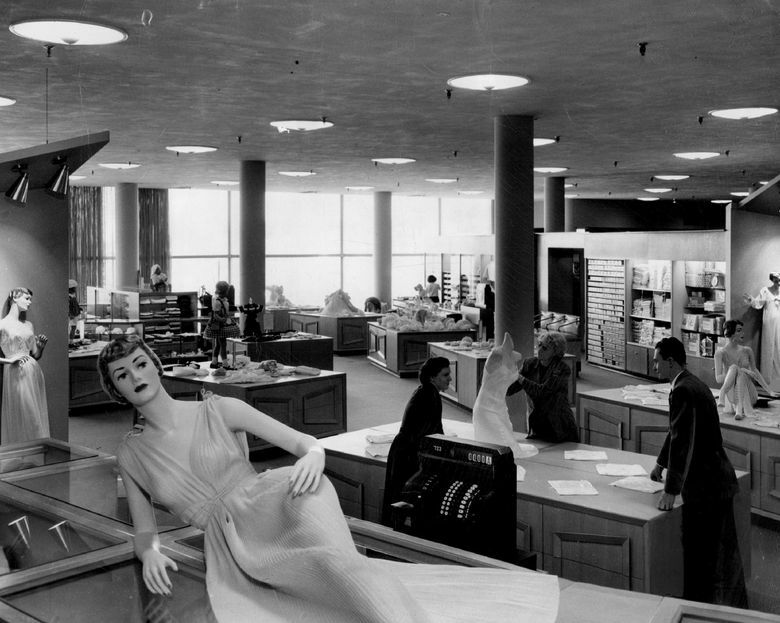 America’s population was half of today’s number when the first malls opened in the early 1950s. The existential threat of climate change was mostly unknown. The roads, like our future, seemed wide open. Mobility, choices, freedom — these were the rewards for our parents triumphing over the Great Depression and helping win World War II. Together, the mall and the car were the future. This era, now as bitter as sweet, is coming to an end, at least in many parts of America. Locally, exclamation points were added this past week to the transition when Macy’s announced it would close its store at Seattle’s redeveloping Northgate Mall and the Alaskan Way Viaduct was closed to begin its demolition. The future will be complicated. It will still be car-dependent for many regions, despite autos producing so much climate-change-causing greenhouse gases. Some malls, retooled and located in affluent suburbs, will continue to prosper despite changing shopper habits. But the past is worth some reflection. To be sure, this postwar American dream wasn’t enjoyed by all. Minority veterans couldn’t collect all the benefits of the GI Bill. New suburbs were often redlined to keep out people of color, and they.were viewed with suspicion in the shiny new malls. But for the white majority, the suburban boom that began in the 1950s provided a way out of declining and “dirty” cities. Thanks to low-interest federal loans, homeownership was in reach for the first time. New roads and freeways provided easy access to shopping malls. In Seattle, Northgate, one of America’s first malls, didn’t kill downtown. Shopping in the core remained popular. Most cities weren’t so fortunate. My hometown, Phoenix, became a city of malls. As a child, I remember a vibrant downtown even after the first mall, Park Central, was built two-and-a-half miles north in the late 1950s, on the site of an old dairy. But then most major department stores relocated to the mall and downtown began a sharp decline. In the 1960s and 1970s, more malls were built as the metropolitan area spread out. Downtown retail died. Still, the arrangement retained charm and intimacy. I went to high school in a Scottsdale much smaller than it is today. We could walk to Los Arcos Mall, anchored by Sears and the Broadway, see friends, watch movies, drink Orange Juliuses. We were free, no play dates, with the mall as an essential amenity. We were happy, clueless mall rats. The dynamic played out across America as malls killed downtown retailing in Denver, Dallas, Charlotte, Cincinnati, Kansas City, St. Louis, on and on. With the exception of Jane Jacobs, few intellectuals saw how the combination of subsidized car culture and malls was killing American cities, how freeways had annihilated priceless neighborhoods and urban connective tissue. And a virus was eating away at the malls themselves, although it would take time for that to become fatal. Big chains bought local department stores — The Bon Marché in Seattle, Goldwater’s in Phoenix — that were the backbone of malls. The leverage buyouts of more than 250 profitable department stores by financier Robert Campeau in the 1980s led to a massive bankruptcy filing. Federated Department Stores, owner of Macy’s, emerged but the sector never fully recovered. It was under Wall Street’s thumb, and Federated gradually forced the Macy’s name on valuable local brands like the Bon. Similar financial hustles wounded many mall specialty stores. By the new century, tastes had begun to swing back. Younger people especially wanted the authenticity of downtown shopping. That was a big plus for the few cities such as Seattle that had kept center city retailing. But the old postwar model was hurt even worse by the Great Recession, which savaged suburbia, and by online shopping, which put every brick-and-mortar store at risk. In 2017 alone, 8,600 stores closed and the Death of the American Mall became a subject of much examination in the financial press. Rising inequality and massive spatial segregation in the nation’s sprawling metropolitan areas further undermined the postwar dream. It opened opportunities for Walmart and Dollar Stores, but not for traditional malls. Roads became clogged, dangerous and time-consuming. Happy Motoring was no longer so happy. Suddenly, for many millennials and empty-nest baby boomers, car dependency and suburban living looked as outmoded as streetcar cities appeared 70 years earlier. In Seattle, widespread transit, including light rail and commuter trains as well as buses, are the preferred mode of travel for many. Northgate’s future is transit-oriented development. A majority of today’s Seattleites would embrace a high-capacity subway system, three-quarters paid by the federal government. Tragically, when just this deal was offered in 1968 and 1970, with funding secured by Sen. Warren Magnuson, voters of that era rejected it. Worse, the feds no longer provide such infrastructure investment. For millions, life will continue to revolve around the shopping mall and the automobile. But that life won’t be as sweet. We’re no longer young.